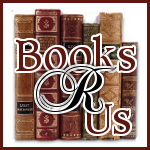 I want to welcome Charles Todd to Books R Us. They are the authors of the Inspector Rutledge mystery Proof of Guilt. Thanks for stopping by. Can you tell me who or what was the inspiration for the book? While on Madeira, we learned that the harbor in Funchal had been shelled by a German submarine during WW1. Rutledge couldn’t come to Madeira—and so Madeira had to come to Rutledge. And while there we had an opportunity to sample fine quality Madeira and Port, and that gave us the connection to England that we were looking for. Visiting a wine shop was not only fascinating but terrific background material as you watch how the process is done. Writer’s block—in our experience at least—usually means there’s something we’ve missed somewhere, something that isn’t working out right. So we go back to hunt for that spot, and sometimes it means cutting or revising a chapter or more to get back to the right track. We see it more as a helpful warning than a “problem.” Sometimes it’s a character, sometimes the way we have perceived the story’s direction, and sometimes it’s just missing where the action ought to be going. There’s another possible problem as well, one we’ve heard other writers talk about. You may think your idea is going to make a great novel, when really it’s better suited to a short story—the development just isn’t there. Can you tell me your experiences in finding a publisher for the book? We were just plain lucky. We sent the manuscript for the first Rutledge mystery to the late Ruth Cavin, a legend in mystery publishing and willing to look at un-agented manuscripts. All we really expected was her opinion on how far we had to go to make it as real writers, or if we should just quit and stay with the day job, so to speak. To our utter surprise, she made us an offer for A TEST OF WILLS, and that was the miracle for Rutledge and for us. How long did it take you to write the book and how long did it take to get the book released? We started TEST around 1994—and almost gave up a couple of times. We sent it to Ruth in 1995, and it hit the bookstores as a hardcover in August of 1996. It took a good year to write the book because there was so much research to be done to have it even close to accurate historically and as an English setting. Rutledge, of course—he’s always our guy. 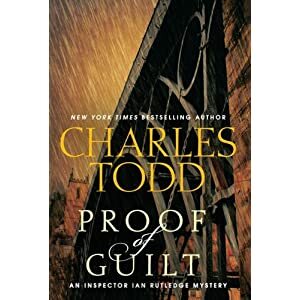 But perhaps the most interesting person In PROOF OF GUILT to write about was one of the suspects, a woman who could have intrigued Rutledge—and probably did. Sometimes you just have a feeling for a character that tells you you’re on the right track. Then there are times when the character stays with you after the book is finished. And she certainly did. What are your current / future projects? This was a busy year!THE CONFESSION, the 2012 Rutledge came out in January just as we were handing in the manuscript for PROOF OF GUILT, the 2013 Rutledge. In June the fourth Bess, AN UNMARKED GRAVE, came out while we were in the process of finishing our holiday novella, THE WALNUT TREE, featuring a new set of characters and for the first time, a love story set against the backdrop of WW1. That came out on October 30, just as we were finishing the June 2013 Bess, A QUESTION OF HONOR. With that safely in our editor’s hands, we’re starting the Rutledge for 2014, as yet untitled. And the paperback of THE CONFESSION comes out at the end of November. A lot of writing, but when you’re enjoying what you do, it’s not as exhausting as it sounds. Meanwhile, we just had a short story in Strand Magazine, another one in The Best American Short Stories of 2012, and Strand wants another one for the Winter Issue. Do you have any tips for a young writer just starting out? First of all, read, read, read. If you want to write, you need to know what the market is doing, what’s being published, and how other writers move characters in and out of the room or set up a chase or whatever. Next, be objective about what you’re writing. Many authors develop a little editorial voice in their heads that says, “Hey, that was lovely prose, but it’s BOR-ing.” Or “Now tell me, would that character really do—or say—that?” or “In real life, would could someone climb down that wall? You’ll have to come up with a better idea than that!” And don’t try to write the next blockbuster. Nobody knows what that will be a year from now. Just write the best novel you’re able to write. Let next year take care of itself. If your book was to be made into a movie, who would you like the main character to be played by and why? Oh, man, that’s been a question that people have asked in just about every talk we give, and suggestions range all over the place. If your readers have any great ideas, let us know! We are still arguing over it. Liam Neeson has the right voice for Hamish. Deep and flexible. The young Colin Firth would have made a terrific Rutledge because he could feel the character, not just play him. David Tarrant is the favorite of English friends. Someone even went as far as to say Daniel Craig has the intensity and the physical ability for Rutledge. Maybe so, but now he’s Bond! What do you like to do for fun when you’re not writing? Where do you like to vacation? Can you tell us briefly about this? Caroline: I love to travel. It’s relaxing and inspiring. But it doesn’t have to be abroad. A new place to explore is just as exciting, learning about how people there live. I catch up on my reading. I enjoy finding new authors to try, because I have the time to do that. Having lunch with friends. And finding time for my cats, who are ready to play, now that I’m no longer spending hours at my desk. .
Charles: I like to travel and to read. I’m also just as happy sitting in a lawn chair on a warm beach watching the waves roll in, a cold ice tea in one hand and a book in the other. I like non-fiction as much as I do fiction. I like to drive and explore and talk to people about what they’re doing. And I’m a political junkie as well as a history junkie. Can you tell me where we can purchase your book? Ask your independent bookseller for the latest Charles Todd—PROOF OF GUILT. They’ll have it. As will the big guns, Amazon and B&N—and it will also be out as an e-book. London, summer 1920. An unidentified body appears to have been run down by a motorcar and Ian Rutledge is leading the investigation to uncover what happened. While the signs point to murder, vital questions remain: Who is the victim? And where, exactly, was he killed? One small clue leads Rutledge to a firm built by two families, famous for producing and selling the world's best Madeira wine. Lewis French, the current head of the English enterprise, is missing. But is he the dead man? And does either his fiancée or his jilted former lover have anything to do with his disappearance—or possible death? What about his sister? Or the London office clerk? Is Matthew Traynor, French's cousin and partner who heads the Madeira office, somehow involved? The experienced Rutledge knows that suspicion and circumstantial evidence are not proof of guilt, and he's going to keep digging for answers. But that perseverance will pit him against his supervisor, the new acting chief superintendent. When Rutledge discovers a link to an incident in the French family's past, the superintendent dismisses it, claiming the information isn't vital. He's determined to place the blame on one of French's women despite Rutledge's objections. Alone in a no-man's-land rife with mystery and danger, Rutledge must tread very carefully, for someone has decided that he, too, must die so that cruel justice can take its course. Charles and Caroline Todd are a mother and son writing team who live on the east coast of the United States. Caroline has a BA in English Literature and History, and a Masters in International Relations. Charles has a BA in Communication Studies with an emphasis on Business Management, and a culinary arts degree that means he can boil more than water. Caroline has been married (to the same man) for umpteen years, and Charles is divorced. Charles and Caroline have a rich storytelling heritage. Both spent many evenings on the porch listening to their fathers and grandfathers reminisce. And a maternal grandmother told marvelous ghost stories. This tradition allows them to write with passion about events before their own time. And an uncle/great uncle who served as a flyer in WWI aroused an early interest in the Great War. CONTEST: Enter to win a copy of The Confession: An Inspector Ian Rutledge Mystery (Inspector Ian Rutledge Mysteries) USA ONLY. Really enjoyed this interview. Thank you for sharing. Great post!! Thank you. Thank you I would like to read it. It doesn't sound like the type of book I personally would be interested in reading, however, I do appreciate the candid and indepth review. Thank you. I enjoyed reading your interview and the Rutledge mysteries are very interesting. It was fascinating to read how they made the connection with Madeira. Interesting! Love the story of how their first book got picked up. I enjoyed reading about the book through your interview. Thanks for sharing. This is very helpful and interesting! Fantastic interview! Also loved your review of the book. Sounds very interesting! Very interesting interview. I look forward to reading the book. Thanks for the great review. Your review of the book was very indepth and intriguing.You have made it sound like a very good read.Thanks so much.